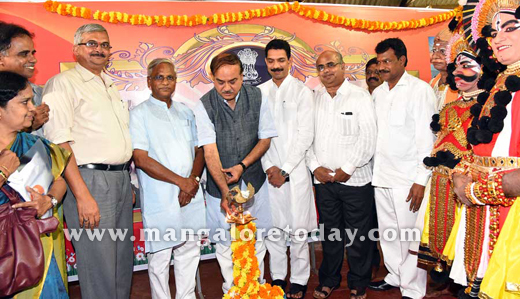 Mangaluru, June 19, 2015: Speaking at a public felicitation programme organised by the Samsadara Sanmana Samiti for Dakshina Kannada MP Nalin Kumar Kateel on June 18, Union minister for chemicals and fertilizers H N Ananth Kumar stated here that the ministry is ready to set up a polymer park in Mangaluru if the state government sanctions 150 acres of land. He added that the proposed polymer park will provide employment to over 20,000 people. I have discussed the proposal with chief minister Siddaramaiah. The CM should also speak to his Kerala counterpart Oommen Chandy for the proposed gas pipeline project between Kochi and Mangaluru. The government led by Prime Minister Narendra Modi is not celebrating the completion of one year but, considering it an opportunity for all of us to re-dedicate ourselves for the progress of our nation.